Having achieved ascendancy over his rivals, Stalin embarked Russia on a colossal programme of industrial growth and social transformation – a second revolution, but this time directed from above by the power of the Soviet state. This claim is substantiated by Soviet statistics on the social composition of the USSR: in 1913, the population was 66.7% peasant and 14.6% industrial workers – an overwhelmingly rural, peasant country. The October Revolution obviously transformed Russian politics and eliminated the old bourgeoisie and landowning nobility, but after 11 years of Soviet power, in 1928 the peasant population comprised 77.8% of the total, with industrial workers accounting for just 12.4%. The USSR remained an overwhelmingly rural, peasant country. It was the achievement of Stalin to thrust Russia into industrial modernity in the space of a decade of monumental upheaval and development – by 1939, peasants accounted for 49.8% of the population with industrial workers at 33.7%. This “Great Turn” involved the implementation of the Stalinist synthesis of policy that had emerged from the debates of the 1920s: the Right policy of socialism in one country, seeking to construct a self-sufficient fortress of socialism within a hostile imperialist world, coupled with the Left policy of rapid industrialisation and collectivisation of agriculture. This topic divides naturally into these two halves: industrialisation (the Five Year Plans) and collectivisation, but first it will be helpful to consider the motives and objectives for the Great Turn. This will aid you in assessing the success of Stalin’s industrial and agricultural policies, which is the most common theme of exam questions. economic – by the late 1920s, the NEP was failing. Industrial growth had reached a plateau and a new approach was needed to generate the capital required for further expansion. Unemployment remained high and the market-based mechanism for grain procurement was starting to break down. To slacken the tempo would mean falling behind. And those who fall behind get beaten. But we do not want to be beaten. No, we refuse to be beaten! One feature of the history of old Russia was the continual beatings she suffered because of her backwardness. She was beaten by the Mongol khans. She was beaten by the Turkish beys. She was beaten by the Swedish feudal lords. She was beaten by the Polish and Lithuanian gentry. She was beaten by the British and French capitalists. She was beaten by the Japanese barons. All beat her because of her backwardness, military backwardness, cultural backwardness, political backwardness, industrial backwardness, agricultural backwardness. They beat her because to do so was profitable and could be done with impunity….We are fifty or a hundred years behind the advanced countries. We must make good this distance in ten years. Either we do it, or we shall be crushed. Nazi Germany invaded the Soviet Union 10 years later – a useful reference if you wish to argue that Stalin was a far-sighted statesman following appropriate policies to prepare the Soviet Union for inevitable war. ideological – the Great Turn represented a more socialist economic policy, abandoning the compromises of the NEP, eliminating private businesses and transforming peasant life into one based (in theory) on collective ownership. Industrialisation was seen as essential for the achievement of socialism – indeed the two came to seem almost synonymous in Stalin’s Russia. political – the NEP was seen as political dangerous in that it fostered the growth of classes potentially hostile to socialism: nepmen (businessmen) and kulaks (rich peasants). Most significantly, the Party had never really gained control of the peasantry, who constituted a significant potential obstacle to the regime, able to hold it to ransom via the obvious peasant monopoly of Russia’s greatest economic resource – its grain production. Stalin – you could argue that Stalin personally sought to accomplish a great revolutionary feat to cement his position as Lenin’s heir. You could also put forward the startling argument that the Great Turn arose primarily as a manoeuvre within the power struggle that enabled Stalin to eliminate Bukharin and the Right – thus one of the greatest economic transformations in history was initiated as a move on the chessboard of power politics within the Politburo. As a final introductory point, it is vital to grasp the essential link between agriculture and industrialisation. For industrial growth, a huge injection of capital was needed. Unlike Witte, facing similar questions in the 1890s, Stalin could not seek foreign loans. The only alternative reservoir of capital available lay in Russia’s agricultural resources. Therefore, the basic logic of the Great Turn was to reorganise agriculture in order to generate the capital required for industrial expansion (and also the vast pool of new industrial labour required). You need to be able to assess the results collectivisation and the degree to which it was successful. This is the main theme of the three past paper questions on this topic, although the role of collectivisation in the broader economic transformation has also been addressed (June 2009). collectivisation caused a substantial fall in grain production. Excluding the freak year of 1930, output fell from 73.3m tons in 1928 to an average of 68.8m across 1931-4 (by comparison, output in the last peacetime year of the Tsarist regime was 80.1m). This can be explained by the chaos and turmoil created by the rapid and violent implementation of the policy, and by widespread peasant resistance. A capitalist economist might also claim that collective farming removed the basic incentive (profit) for peasants to maximise production. Although collectivisation aimed to modernise agriculture, the machinery required for this did not really materialise in the 1930s – by 1938 only 48% of harvesting was conducted by mechanical means – and did not cover the loss of draught animals (below). peasant resistance caused an even more catastrophic massacre of livestock, from which stocks did not recover for years and even decades. The figures are astonishing: in 1928 there were 146.7m sheep and goats in the Soviet Union; in 1933 there were 50.2m. thus, considered as a policy designed to improve and modernise Soviet agriculture, collectivisation must be considered a disastrous failure, at least in the short term of the 1930s. 10 million “kulaks” were deported to suffer hardship in Siberia or in labour camps. It is estimated that 2-3m of them died as a result. 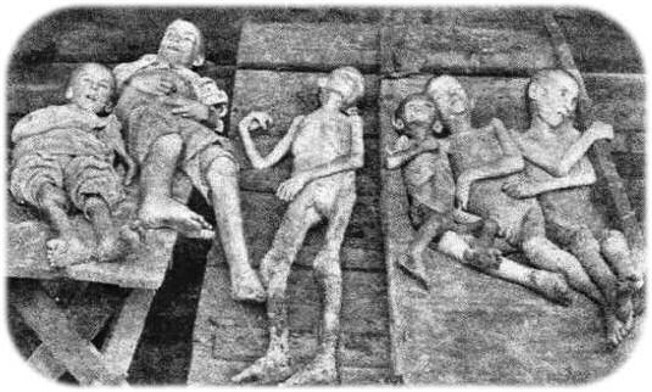 up to 7 million (some estimates are much lower) died in the great famine of 1932-4, largely caused by collectivisation rather than natural disaster – 5m of these in Ukraine. 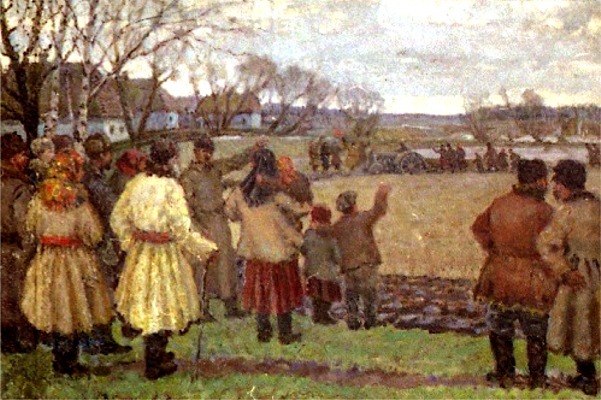 for the survivors, collectivisation seemed a “second serfdom” – the peasants were tied to land they did not own, and could not leave without permission, with draconian punishments if they stepped out of line. On the other hand, careful consideration of the economic objectives of the Soviet state suggests a different picture. 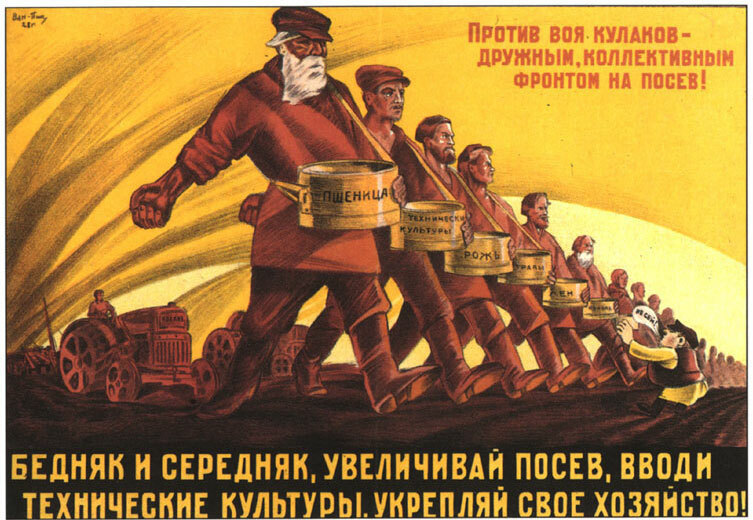 firstly, collectivisation was achieved in the face of extensive opposition and difficulties. By 1931, 61.5% of holdings had been collectivised; by 1941, 98%. furthermore, the objective of collectivisation was not necessarily to increase agricultural output per se, but to increase state procurement of grain, to feed the growing industrial workforce, and for export to raise capital for industrialisation. The figures suggest that these goals were achieved. State procurement of grain rose from 10.8m tons in 1928 to 22.8m in 1931 [note that it is this fact that largely explains the great famine, rather than the drop in output as such. Subtracting state procurement from grain output gives the figure for the grain left to feed the rural population. This fell from 63m tons in 1928 to just 47m in 1931]. Grain exports in 1928 were minimal (just 30,000 tons) but in the crucial years of 1930 and 1931 a total of 9.82m tons were exported. thus perhaps the goal of subordinating agriculture to the needs of industrialisation was fulfilled. there is, however, a counter-argument, which suggests that low world food prices during the Great Depression meant that exports did not raise the funds anticipated, whilst the costs of collectivisation (of implementing and enforcing the policy in the face of such opposition, and of setting up the facilities to produce agricultural machinery) actually outweighed the gains. in the short term, collectivisation created political problems for Stalin and the Soviet state. The state perhaps lost control of events in the chaos of 1930-1, whilst Stalin’s own position at the top may have been endangered by the apparent validation of the Right’s warnings of the danger of breaking so violently with the peasantry. in the longer term, the goal of breaking the peasantry and bringing the countryside under the control of the Party and in service to the urban economy were achieved. Collectivisation enabled the Party to control the countryside through a network of local soviets, kolkhozes, and machine tractor stations. The peasantry were never again in a position to hold the Soviet state to ransom. additionally, the violence and class war generated by collectivisation (and by the propaganda emphasising the struggle against the hostile class of kulaks) may have served to rally the Party behind Stalin. There is evidence that many workers and Party activists (the Twenty-Five Thousanders) welcomed the chance to settle scores with the recalcitrant peasantry or to participate in a heroic struggle for socialism – further evidence to support the idea that Stalinism was to some extent driven or at least influenced by pressures from below, and was not simply imposed by the regime upon a hostile population. This entry was posted in AS revision notes, Russia and tagged AS revision, history, Russia, Stalin, USSR by therationalcolonel. Bookmark the permalink.